The United Arab Emirates is among the top water-scarce countries in the world. However the country has one of the world’s highest per capita water consumption of 550 liters per day. The country is experiencing a rapid increase in population which has in turn resulted in huge demand for water. In 2009, the total water demand in UAE was estimated at 4.5 billion m3 (BCM) which was met by groundwater (72%), desalinated water (21%) and retreated water (7%). This sector accounts for about 24% of total water consumption in the UAE. One of the largest contributors to water consumption is the use of air conditioning systems which is in widespread use because of high temperatures almost throughout the year. An air-conditioning system not only consumes vast amounts of energy, but also uses large quantity of water via chilled water pumps. In addition, the country has the world’s highest per capita consumption of bottled water of 285 liters per year. The water used to fill the bottles is mainly desalinated water, which costs approximately 11.8 billion AED annually. In addition, it takes around 3 liters of water in order to make 1 liter of bottled water. Introduction of new tariff system based on a water meter. Mass awareness on water conservation measures. Introduction of new methods of irrigation, such as subsurface drip irrigation. 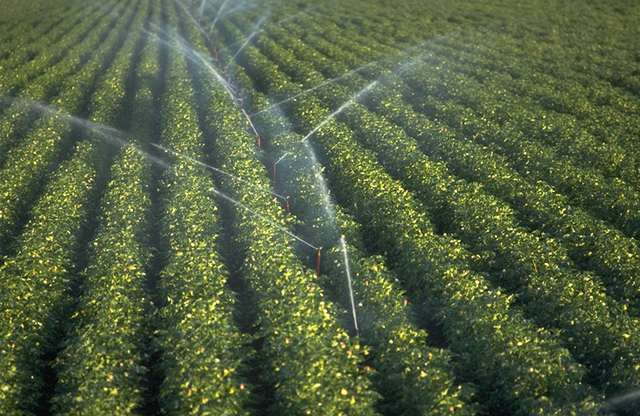 Agricultural sector is responsible for two-thirds of all water consumption in the Emirates. Rapid population growth has led to a surge in food demand, which has resulted in additional stress on water resources. One of the largest contributors to water wastage is low irrigation efficiency. As mentioned above, it takes about 12-15 liters to water 1 m2 of land daily, 30 percent of which is lost to evaporation while using traditional irrigation methods, such as spray irrigation. United Arab Emirates has taken crucial steps to battle this crisis. The government has introduced new irrigation techniques that are more efficient, such as drip irrigation, which use 35% less water than traditional systems. The country has also moved away from crops that are water-intensive, and is also experimenting with use of wastewater for irrigation. A change to less water-intensive crops coupled with a change in irrigation techniques would dramatically decrease the amount of water used inthis sector. Spray irrigation has higher efficiency than traditional methods. Industries consume around 9 percent of all water consumption in the country. Most of the water is used to cool and clean impurities from machinery, which is then transformed into run-offs causing pollution in nearby environments. The wastewater produced is not lost and can be used for irrigation. The government has taken steps into utilizing industrial wastewater. For example, in Abu Dhabi, a total of 600 million m3 of treated wastewater is produced a year, but only 352 million m3 is used for landscaping and district cooling. Industrial wastewater will need to play a more prominent role in all three sectors if the country is to move forward. Water management in the United Arab Emirates can be improved through a variety of measures. The government has made sufficient arrangements for supply of clean and drinkable tap water from desalination plants. However, on its journey to households, the water is contaminated in two ways: The first is through old and rusted pipes. Water flowing through ageing pipelines would become contaminated with bacteria, which makes it undrinkable. The second is through storage tanks. Dead birds, rats, insects and metals can be found in storage tanks, which would eventually cause water to become harmful. This happens because storage tank cleaning, which has to be done approximately every 6 months, is left to the owner of the property. Because there is no law enforcing it, most landlords are not too keen to spend money on it or simply forget to clean them. Replace old pipelines to stop water contamination. Enforce a law requiring landlords to clean storage tanks. Hire professionals to assist in tank cleaning. Hire experts to carry out surprise inspections. Incentivize people to use tap water by increasing bottled water prices. Educate people about the benefits of consuming tap water. UAE has introduced drip irrigation as a means to conserve water, however its widespread use is yet to pick up. The government should make it mandatory for farm owners to use drip irrigation which could save upto 8 litres of water per m2 every day. Following initiatives are required on the part of the government to promote drip irrigation in the Emirates. Motivate farmers to install drip irrigation systems. Provide subsidy for installation of drip irrigation systems. Educate farmers on how to operate and maintain drip irrigation systems. Educate farmers and general public about long-term effects of water scarcity on agriculture. In a country where water might one day become more expensive than oil, one cannot ignore the fact that a big crisis is looming ahead. United Arab Emirates is one of the largest consumers of water per capita globally, but is also one of the most water-scarce countries in the world. Management of water is essential due to increasing population, growing industrialization and dwindling natural water resources. The biggest challenge for the UAE is not finding different water sources, but decreasing the demand for it and minimizing water losses. There are currently 100,000 hectares of cultivated land in the UAE and huge amount of water can be saved by making use of basic water conservation measures. Implementation of effective policies/legislations and public support is key to success of water conservation programs in the country. Tagged Abu Dhabi, Agriculture, Air Conditioning, Drinking Water, Drip Irrigation, Industrial Wastewater, Irrigation, Spray Irrigation, UAE, United Arab Emirates, Water, Water Conservation, Water Conservation in Middle East, Water Management in UAE, Water Management Methods. Bookmark the permalink. Abstract Provoked by the threatening situation of water scarcity, this paper aimed at analyzing the current situation of supply and demand for water in Saudi Arabia. The analysis depends on data from, Statistics of Ministry of Economics and Planning, Ministry Water and Electricity in Saudi Arabia, various issues of Statistical Year Book of the Central Department of Statistics and Information and FAO statistics. The authors employed descriptive statistics for analyzing the supply and demand for water in Saudi Arabia during the period 2000-2014. Water scarcity index was estimated for the study period. Regression analysis was employed for estimating the supply and demand functions for water during the period 2000-2014. Results obtained indicated that the increase in total supply of water may be attributed to the increase of, desalinated water, treated sewage water, and treated agricultural drainage water. Based on results, the highest water consuming sector is the agricultural sector as compared to municipal and industry sectors. Results indicated that demand for water is positively affected by the harvested area, population size and number of industries; however a negative relationship between demand for water and per capita gross domestic product is detected. Regarding supply of water, results obtained indicated that the supply of water is positively influenced by the production of desalinated water and the storage capacity of dams. However, a negative relationship between supply of water and the cost of production of desalinated water is observed. Results on per capita supply and demand for water, proved the threatening current and future situations of water security and food security in Saudi Arabia. This results, is confirmed further by high values of water scarcity index. Results on total harvested area and wheat production indicated negative trends during the study period, attributable to the risks associated with water scarcity.